It is hard to get myself motivated for a training session after a long day of work (which is always preceded by an early morning workout of course). Coach Beck says I just need to get into Robot Mode and get it done. Less thinking and more doing. 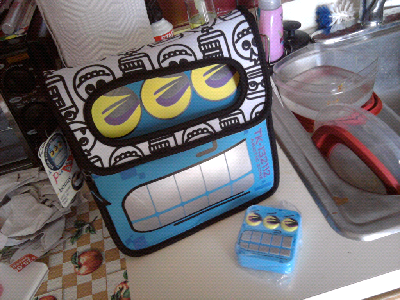 So I bought myself a robot lunchbox with a matching freezable robot cube. That way my robot will stare at me while I'm at work and remind me to ACTIVATE ROBOT MODE as soon as I clock out! He looks like a 3-eyed Bender from Futurama, doesn't he?? I know how you feel... sometimes I get home from work and all I wanna do is crash on the couch and watch TV. But I know I'll always feel better after a training session.